Inne składniki: 100% monohydratu kreatyny. 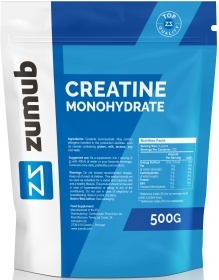 OSTRZEŻENIA Creatine : Do not exceed recommended dosage. Keep out of reach of children. Do not use if you are hypersensitive to any of the constituents of the preparation. Store tightly closed in a cool, dry place. Food supplements should not be used as a substitute for a varied and balanced diet and healthy lifestyle. BEST BEFORE: Please see lot number and expiration date stamped on the packaging.